A month after the fact seems like the perfect time for me to tell you all about my experience of having a stall at MCM London Comic Con! This is going to be a long post so make yourself comfortable! Being the largest pop culture convention in the UK, I knew this was an event I needed to try my hand at eventually, but over the years I kept putting off fully immersing myself into becoming a convention trader. There was always some excuse: too much studying to do, not enough capital to invest in my business properly, working full time at other things and thus having no time or energy to devote to improving my brand... but this was the year I had a lot less obstacles standing in my way. It was time to make the most of it and in July, I secured my table. I spent countless hours researching, sewing, crafting, sourcing materials, developing new products and gathering together everything I might need for a convention of this size. I got myself sorted out with a business bank account and new SumUp card reader; it was time to take things seriously, and stop writing off my brand as a mere casual hobby. Before I knew it, October had rolled around and the final days leading up to the event were going by so quickly. The day before I was due to head off to the Excel Centre to set up my stall, I was still frantically making products! 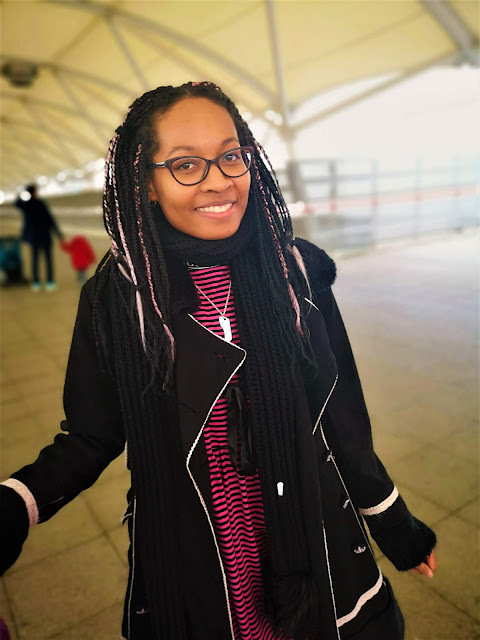 On Thursday 25th October, with the beginnings of a cold coming on, I set off with a suitcase, large tote, and weekend bag in tow, and somehow made my way across London to the Custom House stop on the DLR with the help of my partner who met me on the way at Waterloo. I hadn't been to MCM since 2011 and I couldn't help feeling a little nostalgic as I stood under the canopy outside the venue once more. Sign up was straightforward, and then it was straight to my designated table to get things ready in the very chilly North Hall. My table neighbour was there already, an artist named Abdul. He was from Australia and was amazing company and good fun for us over the weekend! Set up, complete with regulation hi-vis jackets, took a couple of hours in the end; I had never had a 6ft by 4ft space before, nor had I ever had so much stock so it was mainly trial and error. We decided to finish putting the clothing up in the morning, and headed off to our airbnb for what was an absolutely diabolical night's sleep in a dusty basement room on a mattress that felt like a brick. Our previous Airbnb host cancelled on us mere days before the event, so this was the next best thing. It sucked. We ordered a pizza and tried not to sulk too much. Despite being drained and sleepy, we were very excited for day one. Friday 26th October was a very chilly day, and after arming ourselves with a McDonald's breakfast, we set off via bus to the Excel Centre to finish set up and take a moment to admire the finished stall. I couldn't help feeling so proud! 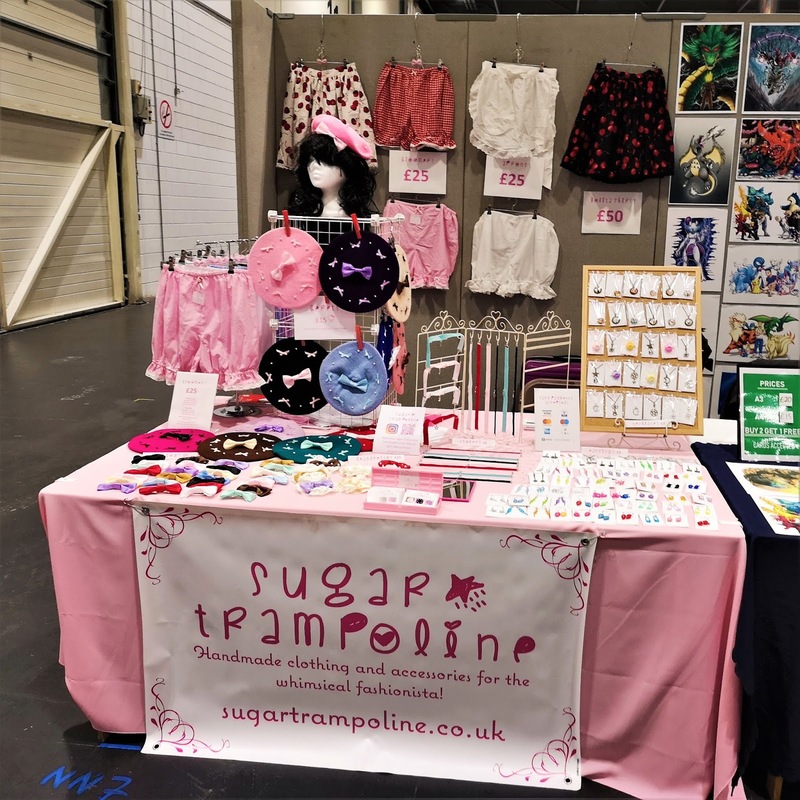 This was the first time my stall has ever really looked the way I wanted it to, and had a stock level that felt "enough", unlike at previous events where my table looked quite bare. Yes! I went for a simple outfit with my Btssb tartan jumperskirt, plus a beret and choker from my brand. My partner has a shiny new phone that likes to make gifs. I'm ok with it. That first day, sales were regular though it wasn't super busy as it was only the Friday. Still, I had quite a few customers and a lot of enthusiasm towards my products, which was lovely to see. I even sold a black Cherry Print skirt which left me shaking with happiness afterwards. There really is nothing like having your work appreciated in person. The vibe of the event was very lively, though very different to my last experience as an attendee in 2011. The direction seems to be a lot more corporate and the layout is very different to how it used to be. I hope there will always be a strong indie trader presence, though, as I think we add a lot of value, heart, and quirkiness to the event that big corporate booths could never replicate! With Day 1 over, I was in good spirits, having absolutely smashed my abysmal sales at Hyper Japan Festival 2016! Clearly, MCM was the right place for me. After we packed up the clothing and covered over the stall for the night, my partner and I headed to the nearest Tesco to pick up something for dinner and some fixings for packed lunches for the following day as we'd been forced to buy overpriced convention food this time round (the two hotdogs we had were pretty nice but not £13 nice, haha). The shop was crammed with convention goers, many still in their cosplays! After this, we caught a bus back to our Airbnb for another uncomfortable night's sleep where I was dosed up with Lemsip to control my cold symptoms. Saturday 27th October was absolutely insane. Oh my goodness. I have never been so busy at an event in my life and the rush was actually quite invigorating. Things kicked off with us missing the bus and arriving as the event was due to open. We needn't have panicked, though; lots of other vendors hadn't arrived either and the con-goes were pretty slow to make their way through the hall. I was glad I made the decision to not wear anything intricate in the end (my Lazy Oaf dress and top were so comfy!) as we were constantly rushing around behind the stall to replenish sold stock or handle transactions for customers. A lot of people wanted to pay by card which made me so relieved to have bought my new card reader, but phone signal at the Excel was pretty bad during peak traffic. There was an agonising 5+ minute wait for one transaction to go through that honestly gave me the sweats, haha. Thankfully, customers were very understanding and patient. Well, most of them were pleasant. I won't forget my encounter with an American guy who bought 7 hair bows, and proceeded to try to find out where I was staying for the weekend, and what I would be getting up to after the convention because he's "really into partying" and thought we should get together... I'm sure you know where this was going. Despite me making extremely obvious I was in no way interested, he remained very insistent about me giving him my instagram handle, and wouldn't leave as he'd decided we should exchange info first. In the meanwhile, my flipping partner of over 6 years was busy dealing with a customer behind the table (I was beside the table at this point) and I couldn't make eye contact. As soon as this creep was gone I immediately went onto instagram and blocked him. What made the situation more uncomfortable than it needed to be was the fact this was a customer, and this was my workplace. I found myself wondering during this painful encounter, if I'm any more blunt with this person, will they try to be spiteful and do a chargeback on the purchase they just used their card for? It put me in an unfair position where they had leverage. Moving forward I have a better idea of how I'll handle harassment like this if it happens to me again. It left me feeling really irritated and quite sour for a while afterwards until I realised I shouldn't be angry at myself for someone else's completely inappropriate behaviour. Anyway. The rest of the day was really good! I sold a ton of earrings, and my new choker line did way better than I was expecting. Berets were flying off the stand, and I had never felt more confident in my product before. The most exciting thing was multiple people coming to my stall to say they followed my instagram. Considering my practically non-existent online following this was such a pleasant surprise! I ended up making friends with a fellow trader whose table was on the other side of the hall. The ease with which I was able to talk to everyone was great, and it felt like we were all part of a little community. The day came to an end at long last after pages of sales in my little notebook log. During my chats to fellow vendors, my partner covered over the stall for me, and then we headed off for Tesco again to grab something for dinner. Back at the Airbnb, our host talked at us for ages about going to a farm near Guildford that day to pick pumpkins and squashes. It was very awkward as she basically had us cornered in the kitchen when all we wanted to do was eat and turn in early. Still, she gave us a slice of carrot cake each for our troubles and all was well... until she began making loud cat noises to herself in the otherwise silent kitchen. I will never forget the two of us slowly turning to look at each other in complete incredulity while our host continued making a series of meowing noises while she prepared vegetables for her dinner. We made an excuse to leave and practically ran to our room and locked the door. Bedtime could not have come soon enough. So, Day 3. We were absolutely cream-crackered by this point after yet another terrible night's sleep in our naff little basement room. Sunday 28th October started off with me feeling incredibly nauseated. I genuinely did not know how I was going to get through the day. That is, until table neighbour Abdul gave me some mint chocolate biscuits. I now think of these as being made of magic because my nausea immediately subsided after eating just one, and I felt so much better. I was so lucky to have ended up next to someone so kind that weekend! Sunday mimicked Friday in a lot of ways, though this day was definitely more of a family day. I saw so many parents with pushchairs, and there were a lot of small children to keep an eye on as they had a habit of wanting to grab everything on the stall, especially as most of what I sell is colourful and enticing, haha. 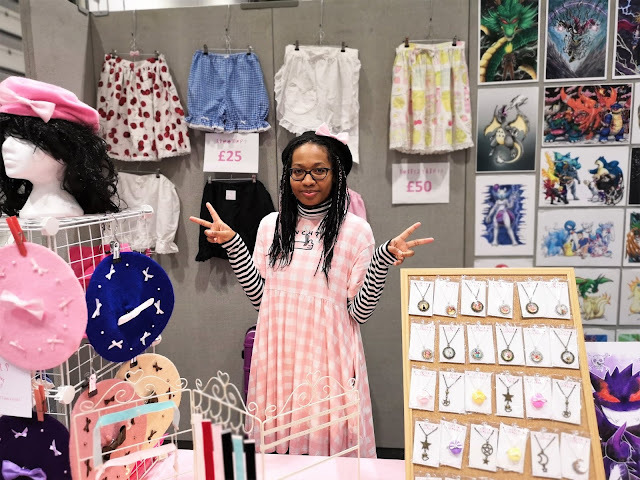 I also had a few of the rude, middle-aged mums I had back at Hyper Japan-- the sort who made fun of the products and thought it necessary to dramatically ask why on earth they'd wear something like that. Right in front of me. I think I'm going to start asking people like this why they think it's OK to make fun of someone's work while they're standing right there. On this occasion, I mainly just stared at them until they noticed my expression (but pretended not to) and walked away. There were a few people who I'd seen having internal struggles over the weekend, not-so-subtly walking up and down past my stall multiple times before finally making the commitment to purchase on the final day. I also saw people over the weekend wearing items they'd bought from me, which made me smile every time. The Sunday look consisted of more Lazy Oaf, plus a Btssb cutsew. As the day wrapped up I could finally have a flip through my sales book and see not only how much money I'd made (enough to cover my costs I'm happy to say!) but also which items sold the best. In terms of quantity, people really went wild for the earrings! 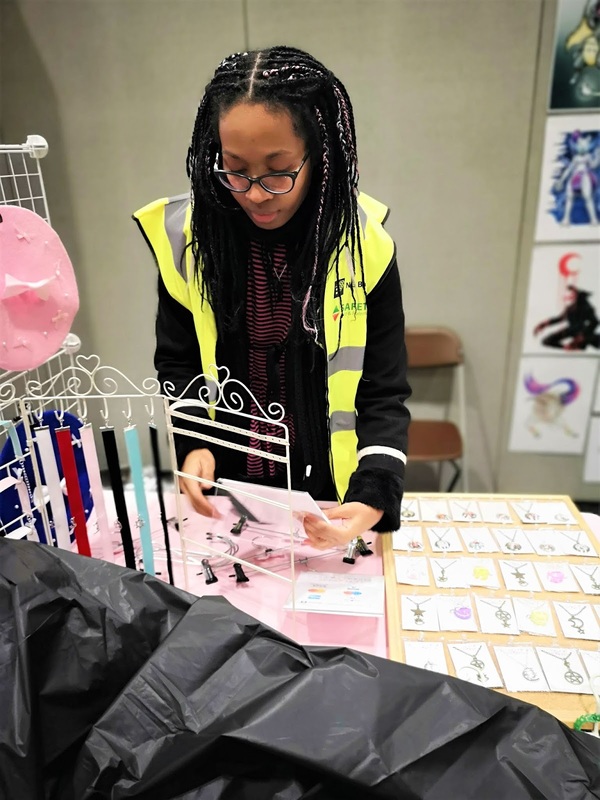 The price point seemed to work well for the convention environment, and I'd worked hard to choose charms that were a bit different to what other people were selling. 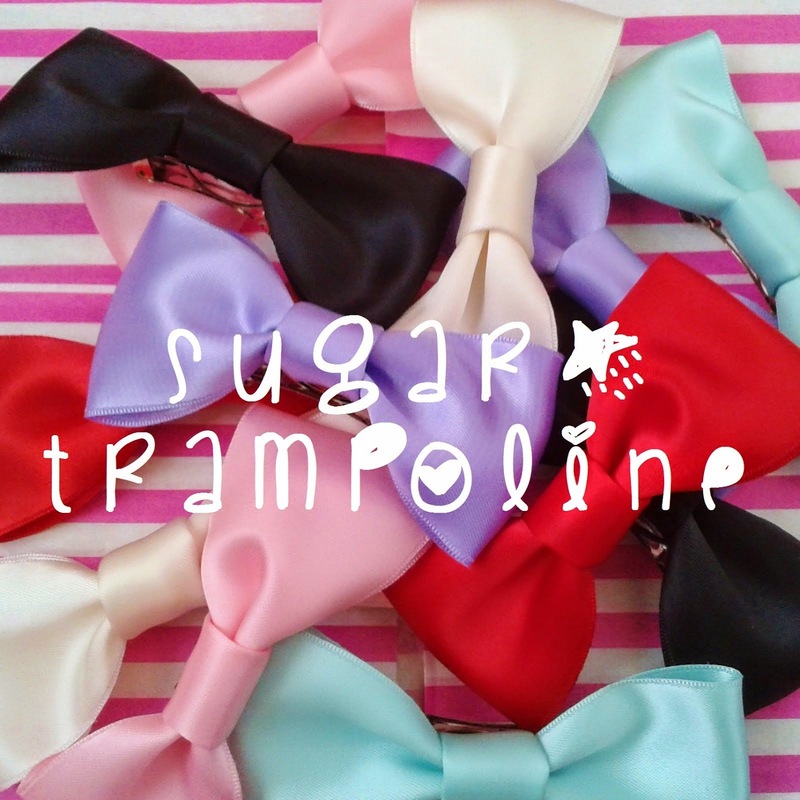 Other favourites were hair bows and berets. I think the cold weather really helped me to sell the latter and I actually ran out of the black colourway, which I think may have caused me to lose out on a couple of sales. It was a huge learning experience, but for the first time, it seemed like I'd really found my feet in this whole small business thing. 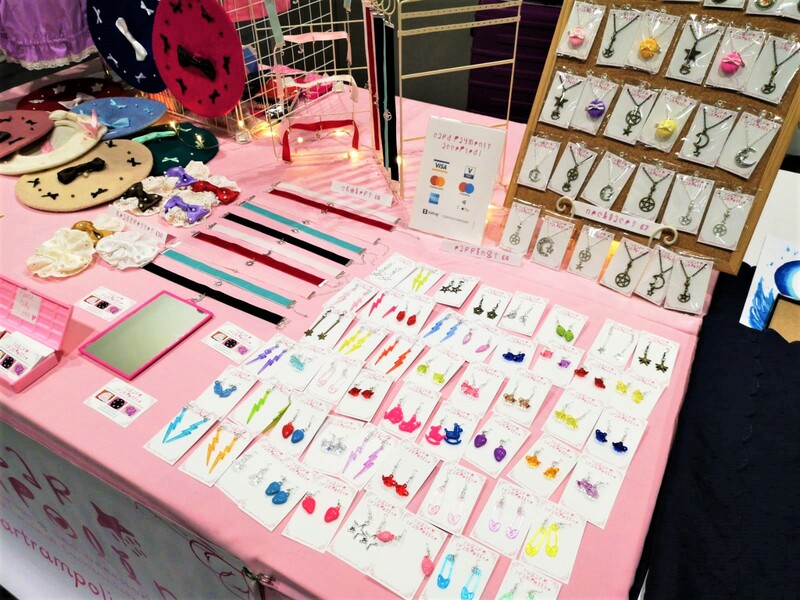 I really took the time to professionalise everything, from getting custom jewellery backing cards printed, to having a more dynamic layout with clear pricing. It absolutely paid off and I know for sure this is the direction I want to take my business in. 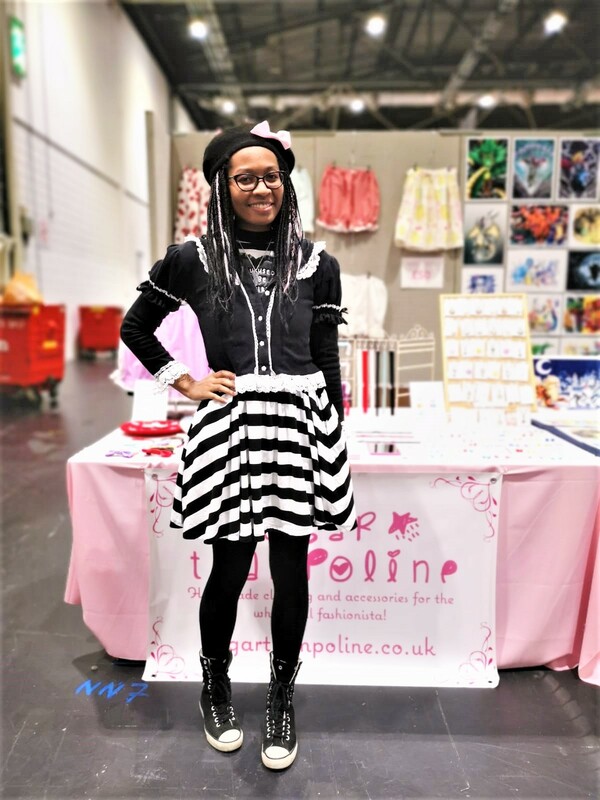 I will most certainly be back at MCM London Comic Con for the spring show in May next year, and I'm already looking forward to it! I will be commuting from home this time, though, because when all's said and done, Airbnb didn't save me much commuting time, stopped me from getting any rest during a time when I needed it most, and meant I had to subsist on junk food for four days. Just one of those life lessons learned, I guess. Just after they announced the convention was officially over! On Sunday night I slept like a log; not even the uncomfortable bed could keep me awake after an evening where I was hit with a terrible fever that left me a crying mess. My partner ordered us McDonald's via UberEats as it was way too cold (and frankly quite a scary neighbourhood where we met two druggies over the weekend) to venture back outside. I was well enough to travel home on the Monday but since then, I've not been 100%. I spent a few weeks with a rubbish virus, and am now left with a residual cough that won't leave. The usual November thing, I guess. Despite all this, the experience was so worth it and I've been such a fidget ever since because I'm so hyped to do another convention. Stepping out of my comfort zone was more rewarding than I could have imagined. So many more people now know about my brand, and having people completely new to what I do buy items with no hesitation was an indescribable feeling. 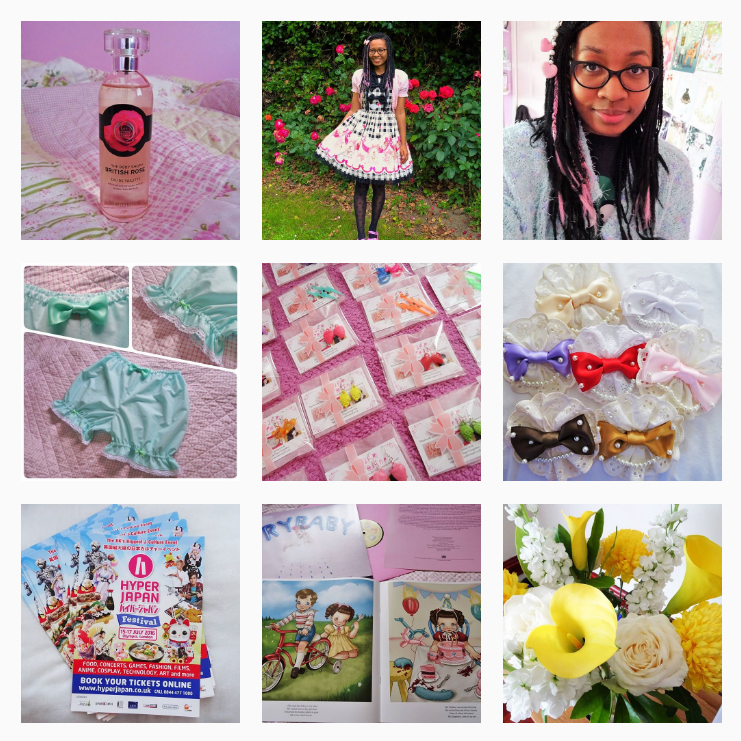 If you managed to get through this incredibly long and rambly post then thank you so much! I hope you enjoyed my account of this very hectic weekend! I'm sorry to wear that you got so sick but other than that (and the icky people, and the airbnb) it sounds like it was a great experience. I'm so glad it went well for you! 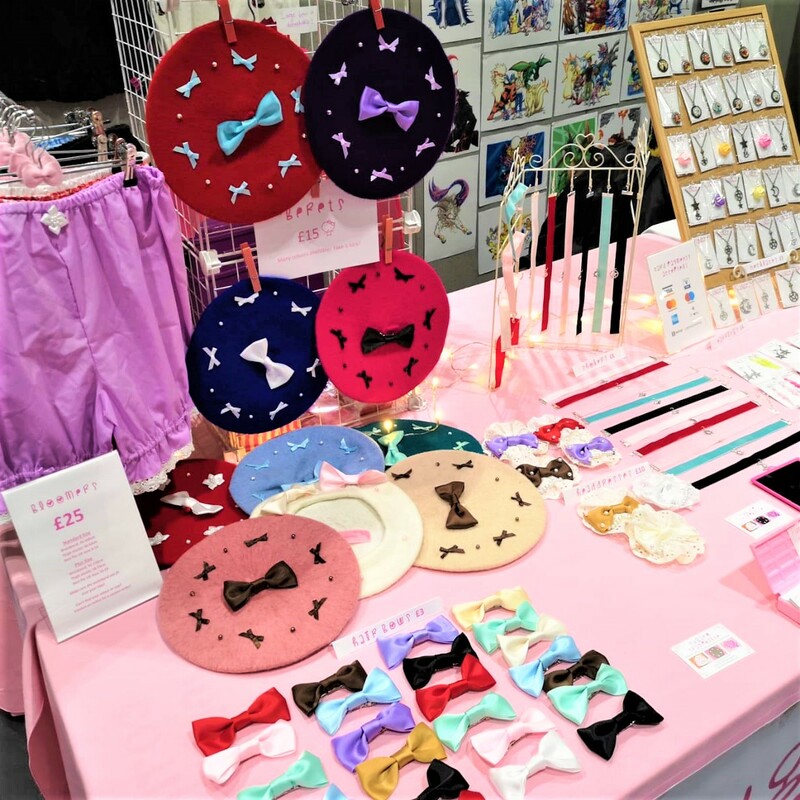 I'd have to agree wholeheartedly with that assessment of Hyper Japan. Both traders and attendees are fed up of it because it promises so much and delivers so little (whilst charging an arm and a leg to attend), and doesn't attract a diverse enough crowd. 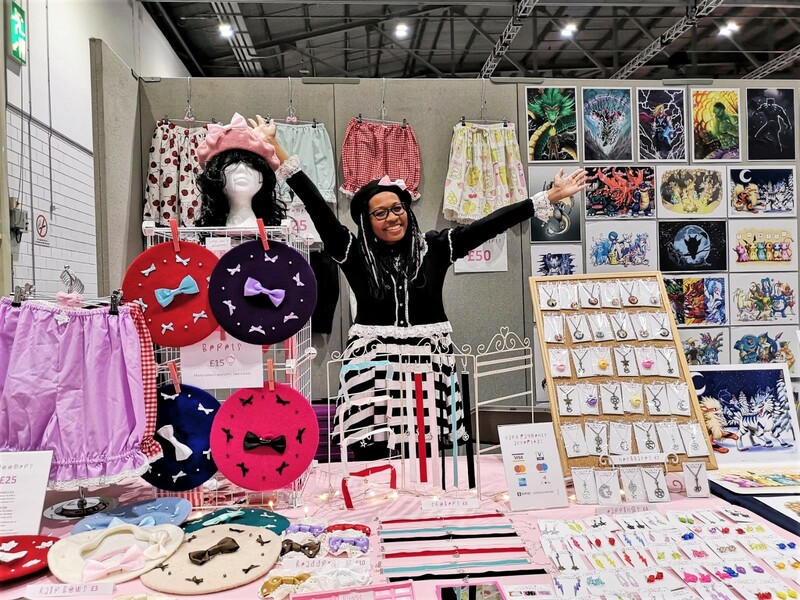 I was so scared MCM would be similar to my Hyper Japan experience but it blew HJ out of the water! People came to MCM prepared to drop the cash to support the indie traders and it was lovely to see. I definitely pushed my body to the point of exhaustion but next time I will just commute from the comfort of my own home and know I will have my usual access to nutritious food and a good night's sleep on my return! Even with all the negatives, though, it was still worth it, and the lessons I learnt for my business were invaluable. Definitely! I've been trying to figure out which cons might work best for me as I would like to do a lot more! I think Doki Doki might be a bit too small for me given the cost of travel and accommodation to get up there, but I do plan to attend MCM Manchester in July if I can snag a table!